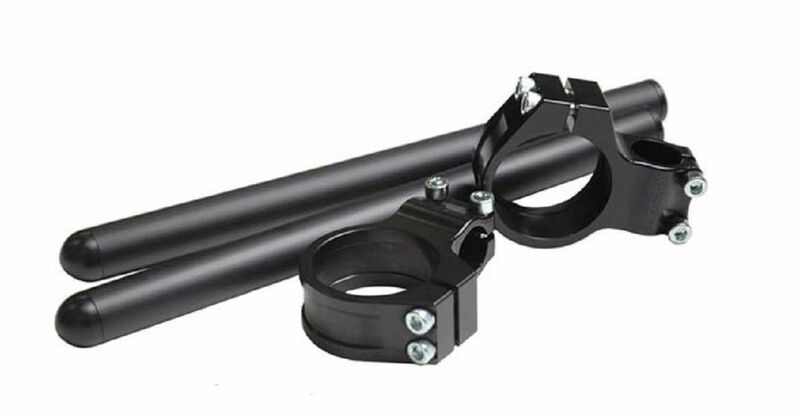 Vortex Clip Ons are machined from solid billet aluminum with a removable handlebar. In the event of a crash, you simply replace the handlebar tube instead of the entire handlebar. The new Vortex Clip Ons sit at a 7 DEGREE angle, giving racers and street riders the ultimate position for rider comfort and leverage. This latest design incorporates a stronger and thinner fork collar for greater adjustability on the fork tube. Includes both collars, 2 handlebar tubes with plastic ends and high tensil strenght fasteners.